As we focus on effective disease prevention in 2017, it is important to identify any concerning trends in reportable diseases. This past year, we’ve seen the highest number of reported leptospirosis cases on record for Michigan. Typically, most cases of leptospirosis are found in Macomb, Oakland and Wayne Counties. This year has been no exception, with more than 75 percent of the reported cases coming from these three counties. As of November 23, approximately 33 percent of the 102 reported canine leptospirosis cases have been in Oakland County dogs—twice the number generally seen. While not all diagnostic testing is done using serology, dogs in Oakland County being tested by serology this year are frequently being diagnosed with the leptospira serovar Icterohaemorrhagiae, a strain of leptospirosis carried by rats. 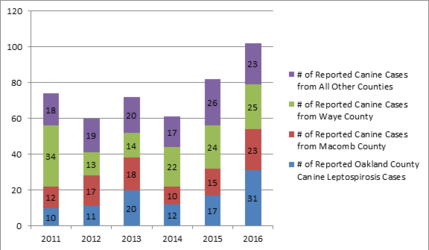 In past years, serology testing on dogs from Oakland County has indicated infection by leptospira serovar Grippotyphosa, a strain carried by wild animals like raccoons and skunks. It’s important to note that some of these Oakland County cases may be coming from bordering counties or from dogs imported into the area. Encourage clients to vaccinate dogs against leptospirosis. Ensure you are using a vaccine that covers the two most common leptospirosis serovars in Michigan, Grippotyphosa and Icterohaemorrhagiae. Inform your clients of the risk to their pet and family members if their dog was to contract leptospirosis. 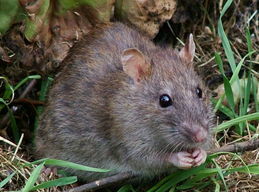 If rats and wild animals have been seen in or around the home, discuss methods to prevent contact. Most importantly, clients should eliminate food, water and shelter sources. Have leptospirosis on your “rule-out list” if you are presented with a dog that is vomiting, anorectic and/or jaundiced, especially if the dog is from or has visited an area where rats and other wildlife have been seen. For more information about canine leptospirosis testing, the Michigan State University Diagnostic Center for Population and Animal Health (DCPAH) has developed a half-page information card for practitioners. Because leptospirosis is a reportable disease in Michigan, DCPAH reports all positive cases diagnosed at the laboratory to MDARD directly. DCPAH also has a one-page guide, “Leptospirosis: What Every Dog Owner Should Know,” in its library of client education resources. These guides are designed to help veterinarians answer owners’ most frequently asked questions and can be printed on-demand for use in clinics or linked to from websites and/or social media. Additional information for veterinarians is available in the 2010 ACVIM Small Animal Consensus Statement on Leptospirosis: Diagnosis, Epidemiology, Treatment, and Prevention. AID is creating a directory of veterinarians writing VFD orders for producers. The U.S. Food and Drug Administration is in the process of making changes to antibiotic availability and how antibiotics can be used in livestock. Historically, a majority of feed-grade antibiotics used in or on animal feeds have been available to producers over the counter. However, the FDA's changes are moving all human medically important feed-grade antibiotics to the veterinary feed directive drug process by January 1, 2017. Producers will be seeking veterinarians who are willing to write VFD orders. As a part of that process, much like prescription use, these producers will need to establish a veterinary client-patient relationship with a veterinarian prior to the VFD order being written. Veterinarians who may not normally handle livestock, small or large, regularly may be asked whether they are willing to write a VFD order. In an effort to provide producers with the best information, we are collecting the names of veterinarians who are willing to write VFD orders. If you are unable to view images, you may have to indicate to your email service that this is a trusted source.